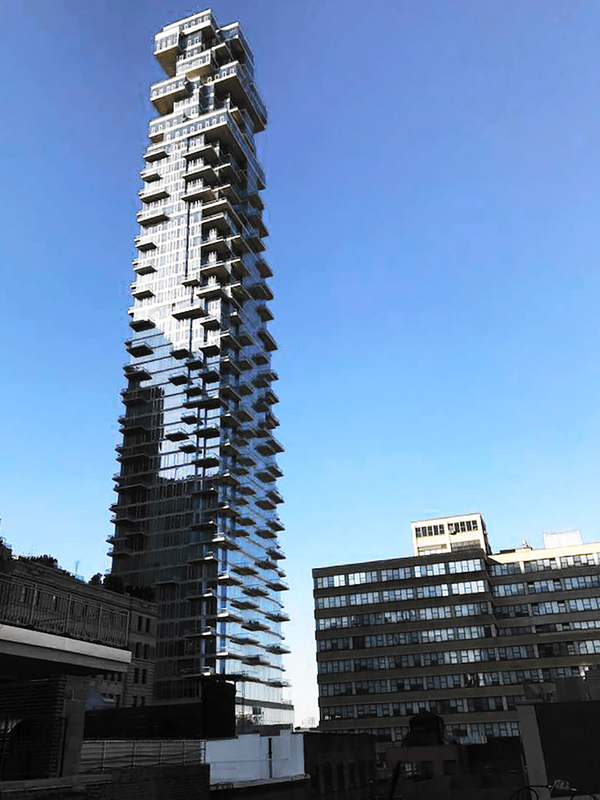 In 2007, New York-based luxury condominium and hotel developer the Alexico Group purchased the land at 56 Leonard Street in Tribeca from the New York Law School for $150 million. Founder Izak Senbahar says on their website that Alexico is “creating properties that are undeniably one of a kind, delighting the most discerning buyers in the most personal ways.” To that end, he traveled to Switzerland to meet with Herzog and de Meuron and invite them to design something special. After touring the site and neighborhood, they wanted to design something in stark contrast to the surrounding buildings. And that is exactly what they did. Often described as the “Jenga Tower,” the 60-story, the 821-foot structure begins as a vertical glass steeple rising into the sky. However, as it rises, successive levels seem to change direction and angle. Sculpted surfaced, cantilevers and profiled edges turn the tower into a puzzle of shifting stories. Each residence and its balcony remains unobstructed as the floors above and below shift in different directions, creating wide spaces and cascading angles that seem to defy explanation. All of this is the creation of the brilliant architectural partnership Herzog & de Meuron. Born within one month of one another in 1950, Jacques Herzog and Pierre de Meuron attended the Swiss Federal Institute of Technology together and founded the architecture firm Herzog & de Meuron in 1978. While their early work was modern minimalist in nature, their recent designs are often considered giant pieces of objet d’art. Ultimately, their vision tends to focus on an appreciation of rectangles, be they simple or complex. Their work has spanned the globe as well as usage, from utilitarian needs to stunning stadia. Their most notable work is undoubtedly the Bankside Power Station conversation in order to make it the home of the Tate Modern museum. They won the Pritzker Prize, the highest honor in architecture, for their work. Some of their other notable designs include the Beijing National Stadium for the 2008 Olympic Games, BBVA headquarters in Madrid, the Elbphilharmonie in Hamburg, and Allianz Arena in Munich. While each building serves a different purpose, they all share the common trait of being impossible not to stand in awe of. 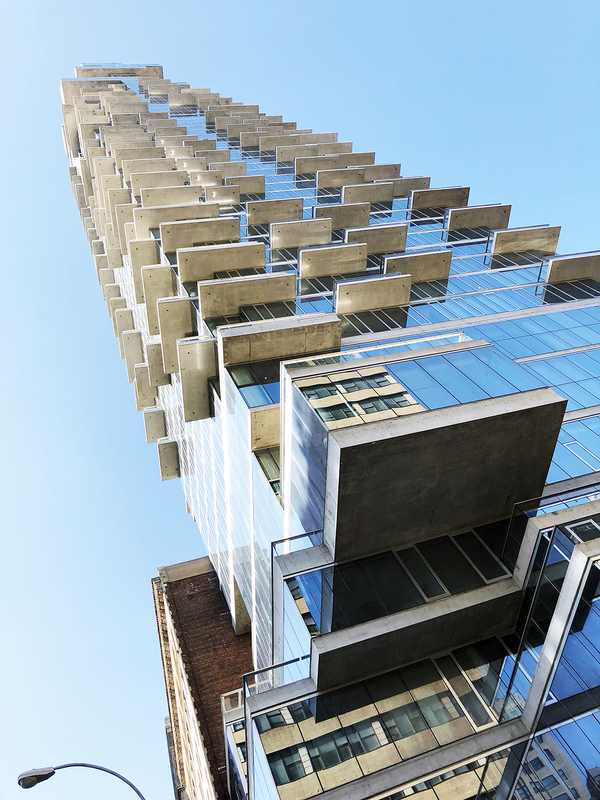 Inside the architectural marvel are 145 condo residences that range from 1,418 to 6,400 square feet and include one to five bedrooms. Herzog & de Meuron’s vision for the building continues inside as they designed the interiors as well. 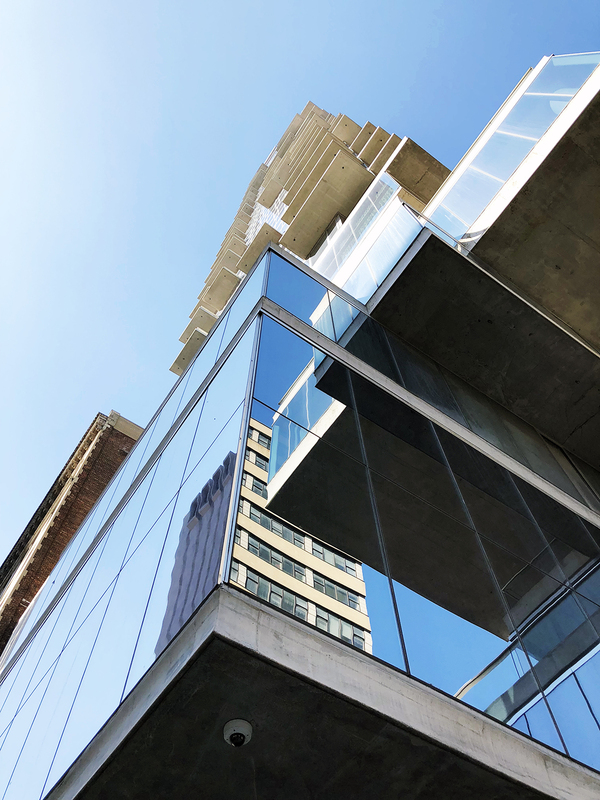 Window walls rise as high as 14 feet, leading to private outdoor patios where residents will have clear views of the skyline, rivers, bridges, and everything beyond them. Living areas are centralized around custom-sculpted fireplaces encased in white enameled steel that offer a counterbalance to the airy openness otherwise surrounding the space. In the bathrooms, custom-designed vanities and tubs offer a sleek but soft experience, surrounded by marble tiles, warm lights, and those massive windows. On the top nine floors, you’ll find the penthouses. 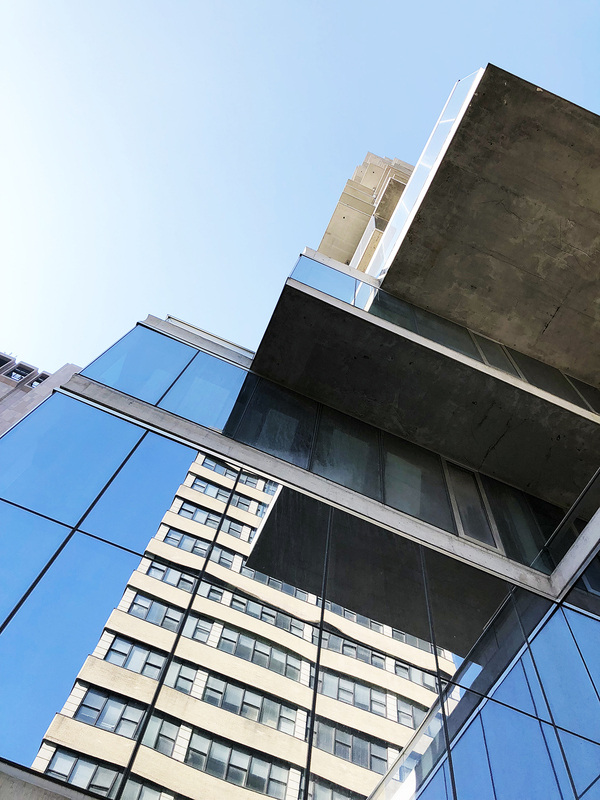 Eight full-floor residences and two half-floor residences, all offering uninterrupted views high above Manhattan out of the continuous window walls that run for 200 feet in some units. Penthouse kitchens include grand piano-shaped islands under a custom-sculpted range hood that provide the starting point from which everything radiates. Private entryways lead through foyers and private gallery space to either the great room or bedrooms. Cedar-lined closets, wood-burning fireplaces, and exercise rooms complete the luxury living experience. 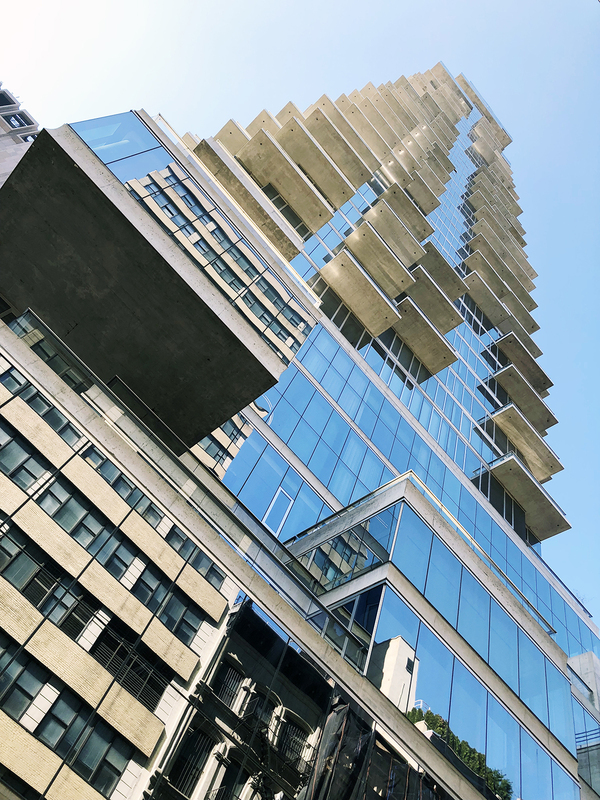 With such luxurious care put into the design of the building and its residences, you better believe that amenities at 56 Leonard Street live up to that standard as well. A Herzog & de Meuron-designed library lounge features a stainless steel fireplace, custom wool carpet, and granite walls to create an austere but welcoming environment. A 25-seat theater with reclining seats and a terrace is, in fact, an indoor/outdoor space, creating the opportunity for all kinds of special events. The 75-foot lap pool connects to a landscaped sundeck outdoors as well as a hot tub that’s cantilevered over Leonard Street, providing spectacular views from 25 feet up. Also included across the amenity spaces on the 9th and 10th floors are the fitness center, steam room, private dining room with catering kitchen, and a children’s play space. 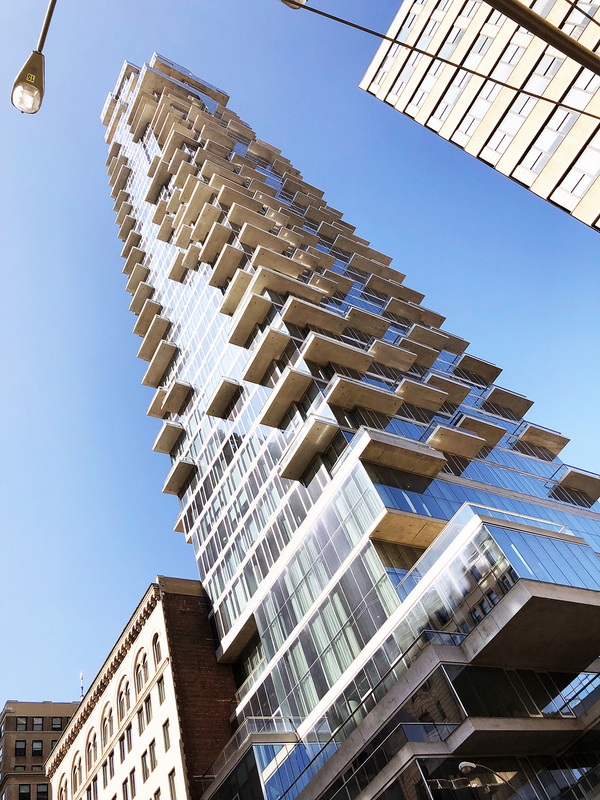 You’ll find 56 Leonard right at the intersection of Church and Leonard streets, a central location in the heart of Tribeca where New York’s culture, history, and modern luxury meet. There’s a good reason its one of the most desirable neighborhoods in NYC and beyond. 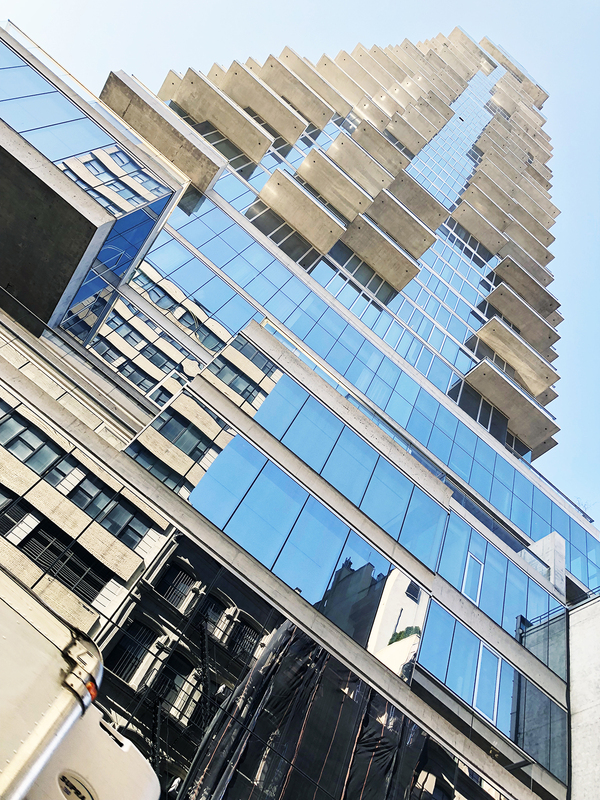 Whether it’s world-class restaurants (Nobu, Landmarc, Bouley), design and shopping (Thom Browne, Steven Alan, Issey Miyake), galleries (NY Academy of Art, Apex Art), or entertainment (Tribeca Cinemas, Canal Room), everything you need or want is within a short distance. You’re also never far from plenty of greenspaces, parks, and the water. 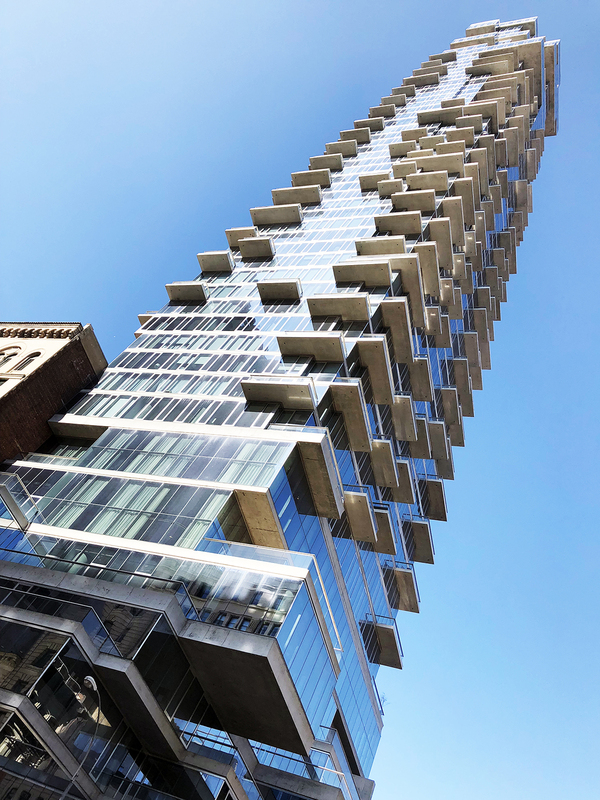 As you might imagine, residences in 56 Leonard started going quick. As of May 2013, 70 percent of the building had already sold. According to Senbahar, the building was 92 percent sold within seven months of pre-sales. In fact, the 60th-floor penthouse ended up selling for almost $48,000,000, one of the most expensive sales below 14th street in 2017. That said, there are still a handful of units available for initial purchase. 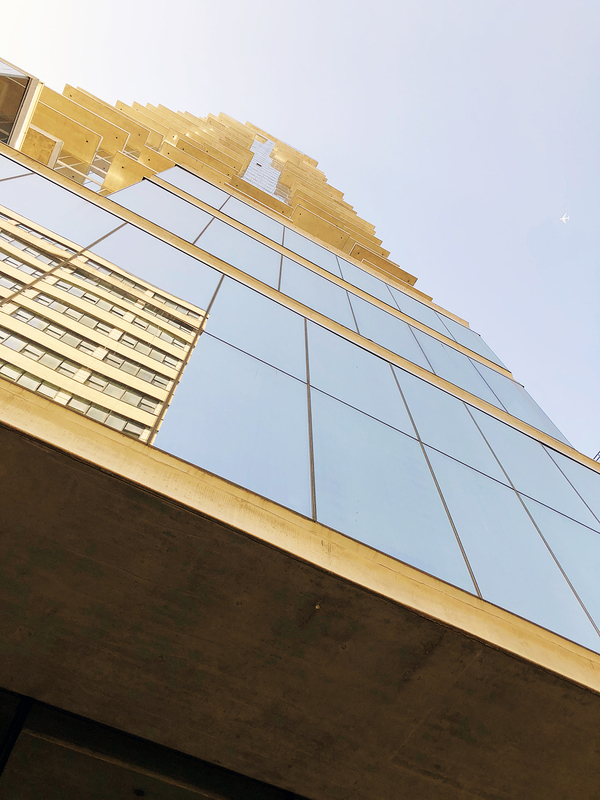 The sole remaining one bedroom unit, which includes 1,027 interior square feet and 130 exterior square feet is available on the 15th floor. A four-bedroom, four-bath residence with over 3,000 square feet and two balconies remains available on the 16th floor. 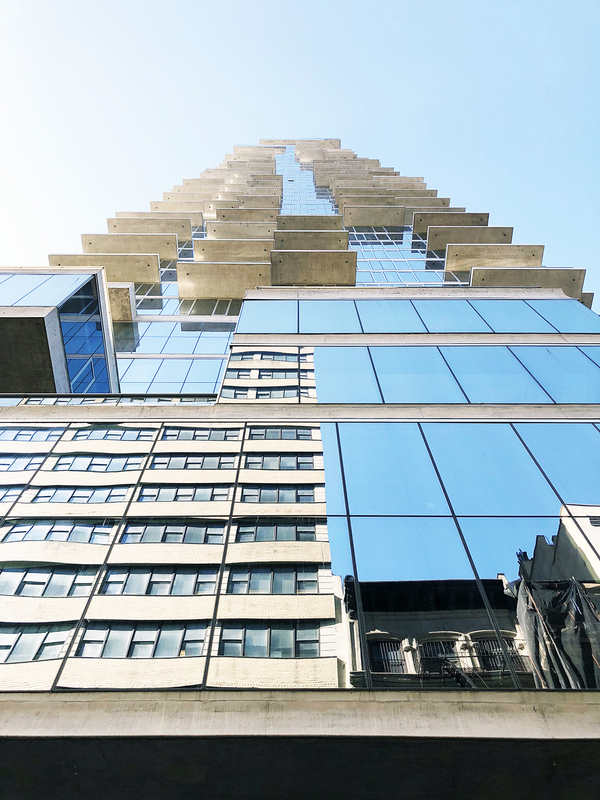 And the only penthouse left is a half-floor residence with four bedrooms, 3,709 interior square feet of space, 14-foot ceilings, and North, East, and South exposure.